All services provided by ABR are based on the principles of Applied Behavior Analysis (ABA). ABR provides one-on-one, intensive behavioral intervention to individuals with developmental disabilities in home, center, and school settings. We work with individuals with varying diagnoses, ranging in age from birth to 22 years. Programs are individualized, data-driven, and address skills across a variety of domains such as communication, academic and early learning skills, social skills, self-help skills, coping skills, motor skills, and play skills. Our treatment programs include skills assessments, training and supervision of staff, as well as, parent and educator training. Services are provided in various locations based on the needs of the individual and the requirements of the funding source. We provide one-on-one in-home and community treatment programs based on the principles of Applied Behavior Analysis (ABA) using techniques such as, Discrete Trial Training, Pivotal Response Training, and Verbal Behavior. Programs are individually designed based on the needs of the person. Treatments focus on reduction of problem behavior (behavior reduction) and acquisition of appropriate behavior (skill acquisition). Periodic skills assessments are conducted to assess the individual's progress throughout the treatment program and to identify additional skills that need to be targeted. Program decisions are data-driven. These services are typically funded through Tri-Counties Regional Center, insurance, Medi-Cal, or private funding. We are a Non-Public Agency (NPA) with the Ventura County SELPA. As such, we provide Behavior Intervention Implementation (BII) services and Behavior Intervention Development (BID) services to students who have these services written into their IEP. 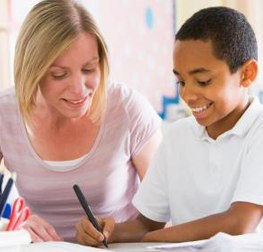 These services allow ABR to provide a one-on-one aide to work alongside the student in the school throughout all or some of their school day. For individuals that do not have an IEP or that do not have this written into their IEP, we can provide these services through private funding. ABR has contracted with various school districts throughout Ventura County. We have also worked in a number of private schools and preschools. Programs are individually designed based on the needs of the person and the goals of the Individualized Education Program. Program decisions are data-driven. ABR also provides consultation with teachers and aides to assess the needs of a student and train the district personnel on the needs of the student. Furthermore, ABR provides classroom-wide, school-wide or district-wide trainings on ABA. One-on-One ABA Services: These are intensive one-on-one ABA services that occur at ABR rather than in the home. These services are based on the principles of Applied Behavior Analysis (ABA) using techniques such as, Discrete Trial Training, Pivotal Response Training, and Verbal Behavior. Programs are individually designed based on the needs of the person. Treatments focus on reduction of problem behavior (behavior reduction) and acquisition of appropriate behavior (skill acquisition). Periodic skills assessments are conducted to assess the individual's progress throughout the treatment program and to identify additional skills that need to be targeted. Program decisions are data-driven. These services are typically funded through insurance, Medi-Cal, or private funding. These services allow for generalization of skills to a different environment, opportunities for socialization with other peers, more access to supervisors and the flexibility of allowing parents to leave the center to run errands and attend other appointments while their child receives ABA intervention. Severe Challenging Behaviors: These services are short-term services that occur at ABR and focus on the assessment and treatment of challenging behaviors that are interfering with the child's functioning in the home or community. The goal of these services is to conduct functional analyses and develop effective treatments for challenging behaviors in the clinic. Once effective interventions are developed, caregivers are trained to implement the intervention and results are generalized to the client's natural environment. Feeding Services: ABR provides functional analysis and treatment to individuals that engage in food refusal and food selectivity. These can be individuals with Pediatric Feeding Disorders, autism or without a diagnosis. Pediatric Feeding Disorders are characterized by difficulties in eating or drinking that affect weight or nutrition. These individuals often develop inappropriate mealtime behaviors (e.g., batting at the spoon, head turning, crying). Individuals must clear a full-medical evaluation prior to being accepted into this program. Services are based on the principles of ABA and involve the systematic assessment and treatment of feeding difficulties. Although young children are often finicky eaters, many children diagnosed with autism spectrum disorders engage in food selectivity. Behavioral treatments might be appropriate for your child if they fail to eat a sufficient variety of foods to maintain their nutritional status. ABR works with these families in developing effective behavioral treatments to increase food variety. Caregiver training is an essential component to this treatment to insure that treatment gains can be maintained without the therapist present. ABR works closely with other disciplines such as physicians, nurses, nutritionists, occupational therapists, and speech therapists. This program may be appropriate for your family if your child has had significant weight loss, fails to gain an appropriate amount of weight, depends on a G-Tube or NG-Tube feedings, or engages in inappropriate mealtime behavior that causes stress to the child or family.